An epic disaster-at-sea story, The Poseidon Adventure helped to ignite the 1970s catastrophe movie cycle and is one of the best examples of the genre. It's New Year's Eve, and the ocean liner S.S. Poseidon is on a journey from New York to Athens. The passengers include fiery Reverend Frank Scott (Gene Hackman), who has a frayed relationship with the Church and encourages individuals to strongly believe in themselves first. Just after midnight an underwater earthquake in the Mediterranean unleashes a massive wave, and despite the best efforts of Captain Harrison (Leslie Nielsen), the Poseidon is struck and turned upside down, still barely afloat. The surviving passengers in the grand dining room are split on whether to stay put and wait for help, or make their way upwards nearer the surface. Scott argues strongly that a perilous climb up towards the hull is the only path to salvation, but he convinces only a small group of passengers to follow his lead. His followers include ex-cop Mike Rogo (Ernest Borgnine) and his ex-prostitute wife Linda (Stella Stevens), teenager Susan (Pamela Sue Martin) and her bratty but knowledgeable younger brother Robin (Eric Shea), band singer Nonnie (Carol Lynley), elderly single man James Martin (Red Buttons), older married Jewish couple Manny and Belle Rosen (Jack Albertson and Shelley Winters), and crew member Acres (Roddy McDowall). They start their ascent and are barely able to stay ahead of the rising waters, while frequent explosions rock their perilous surroundings. Scott and Rogo repeatedly clash, and not all the group members will make it to the hull and the chance at a rescue. 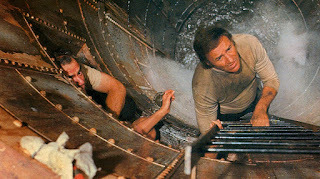 Directed by Ronald Neame, The Poseidon Adventure was producer Irwin Allen's first big-screen success. An adaptation of the Paul Gallico book, the film closely adheres to the now familiar formula of a small group of survivors navigating their way out of a disaster zone, with many candidates lined up to win sympathy and then summarily die. The Poseidon Adventure expertly delivers the requisite mix of thrills and human drama, and invests plenty of time in rounding out its characters into relatively interesting people with distinct personalities. Reverend Scott's small flock is a surprisingly memorable group, and they add immeasurably to the film's enjoyment. The special effects and sets are excellent for the era. Using models, camera tricks and specialty sets, Neame and his production team create a disaster zone for the ages, tipping over a massive ship, creating numerous sets filled with fires, destruction and dead bodies, plus some surreal environments just for good measure: a mammoth blue Christmas tree becomes an essential climbing structure; an upside barbershop and an upside men's bathroom add nothing to the story but are unforgettable touches. Elsewhere, the film offers up a maze of inverted hallways, shafts, staircases, catwalks and submerged rooms for the survivors to try and navigate. The script is co-written by Stirling Silliphant and Wendell Mayes, and provides plenty of bonus fun in the form of obvious religious parallelisms with the Pilgrim's Progress. Scott is a troubled but passionate reverend, and he works hard to convince a group of strangers, a combination of saints and sinners, to become his followers before leading them up to the light. Scott even gets to drag that Christmas tree over his shoulder in a symbolic nod to the cross. On the way to the top Scott's congregation stumbles across another larger group in an almost catatonic state, following a man of science (the ship's doctor) in the wrong direction. The cast get into the spirit and deliver wide-eyed and loud performances, suitably amplified to compete with the surreal surroundings. Ernest Borgnine goes furthest to the extremes of boorishness as ex-cop Rogo, and he gets competition from Shelley Winters as the overweight ex-swimmer trudging along with the group, waiting for her moment of divinity to float to the surface. Gene Hackman is the only bona fide current star in the group, and he keeps a straight face and intense tone as a man who finds his mission in the bowels of an upside ocean liner. The Poseidon Adventure is irresistible Hollywood entertainment: plenty of has-beens, overturned, on fire, in the water, but always looking up.